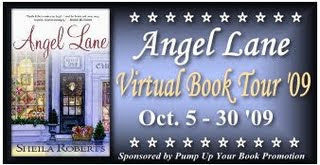 Synopsis via Pump Up Your Book Promotion who is the sponsor for this book tour and provided me with the opportunity to read and review "Angel Lane"
The small town of Heart Lake is beginning to lose its friendly, small town feeling, so Sarah Goodwin, who owns the town bakery, Jamie Moore, owner of The Chocolate Bar, and Emma Swanson of Emma’s Quilt Corner decide it’s time to find a way to help people feel more connected. Their solution: random acts of kindness. And not just from them. The women sponsor a town meeting, encouraging the few people who turn out to start a movement. Soon people all over town are extending kindness to each other in heartwarming small ways. But as the three friends cope with lost cats, mixed signals, business challenges, and unexpected romance, they learn that no good deed goes unpunished. Most important, though, they learn that the only way to get a better life, a better town, a better world, is to give your heart. Sheila Roberts has built a warm and cozy town in her fictitious Northwest town of Heart Lake. Not only is the town warm, so are the characters. Jamie Moore is a skeptic with a thriving chocolate shop. Emma Swanson is positive, happy, and so endearing that you want her failing quilt shop to survive. Even when she thinks everything is just "like the movies!". Sarah Goodwin is the strong momma hen who can grate your nerves with her strength, organization, leadership skills and her heart but deep down inside you wished you were like her. They see that as outsiders are moving in and Heart Lake has lost it's heart and the three devise a plan to put the heart back in to Heart Lake. Do they succeed? I am not spoiling the plot! haha. So read this lovely book! There are no steamy scenes, there is no heart pounding action, no diabolical villain, nor corruption and evil, but there is a lot of heart in this book. Coming from a small town myself, I felt the connection to small town living and taking care of your neighbors which I miss since I have been living in a large city. I did feel the tug in my belly and made me miss home. I think that's the author's point, to remind us of, not of small town living, but taking care of each other. This book is sweet, refreshing and adorable. If you want to just feel good, this book will do it. I know I felt a warmth come over me and wanted to smile at my neighbor. Oh and I can NOT forget this part, after reading about all the yummy chocolates, cakes, pies, truffles, cookies, etc., Sheila Roberts also included some recipes at the end. How fabulous is that? Love it! Sheila Roberts lives in the Pacific Northwest. She's happily married and has three children. Writing since 1989, she has had 24 books published, both in fiction and nonfiction under different names and in different languages. However before she settled into her writing career, she did lots of other things, including owning a singing telegram company and playing in a band. But writing and helping others to find ways to make their lives better are her greatest passions. Her down-to-earth wisdom and quirky upbeat sense of humor make Sheila a popular speaker to groups large and small. Her books are becoming perennial hot sellers. Her book Bikini Season was a Bookscan top 50, a Target Breakout Novel pick and an Amazon Beach Read pick. On Strike for Christmas will be released this year for the third year in the row and has been optioned for film. Her new release Love in Bloom has been chosen as a Reader’s Digest Condensed Book. Now… if she could just get on “Dancing with the Stars”! 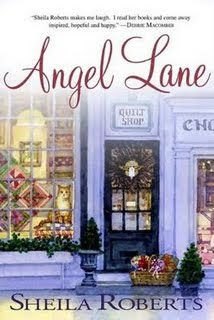 You can visit her website at www.sheilasplace.com to find out about her latest women's fiction novel, Angel Lane. Nice review, Jaime. I read and loved the book. Just a really good story! Sounds like a very heartwarming story, I can't wait to read it myself.